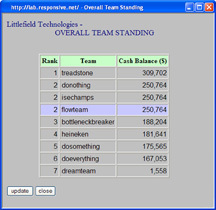 Littlefield is an online competitive simulation of a queueing network with an inventory point. Faculty can choose between two settings: a high-tech factory named Littlefield Technologies or a blood testing service named Littlefield Labs. Assignment options include 2-hour games to be played in class and 7-day games to be played outside class. The game can be quickly learned by both faculty and students. Littlefield was developed with Sunil Kumar and Samuel Wood while they were on the faculty of Stanford's Graduate School of Business. 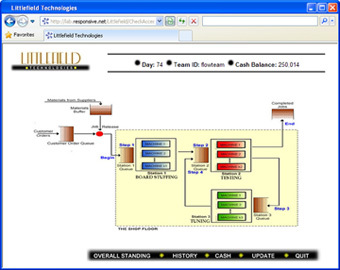 Students monitor operations through an easy to understand graphical interface displayed in their web browser. 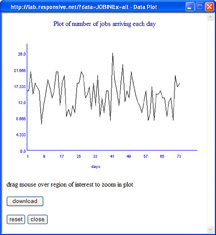 Students view and download historical performance data to understand the effects of past decisions and to guide future decisions. Students can view their score and rank at any time.